The Questers of Magod (177) are few in number but Matt has been building them up recently, rather than expanding their ranks, and now the time has come to take on one of the biggest mobs in our campaign – Da Not So N00bz (281). Okay up until this point the muties have been kinda cautious because they couldn’t really afford any sort of screw ups in terms of loss of guys, but now after a bunch of advances and a couple of victories we’ve actually got some guys who are competent boarders, they have the mutie boarding skill and so this is actually going to be a case of utter, utter shock and awe. I’m going to hit the trukk with heavy weapons first and that’s going to cause, hopefully some gubbinz damage, which will cause scrap to shower around the trukk but if it doesn’t then the very worst it’s doing is inflicting damage. 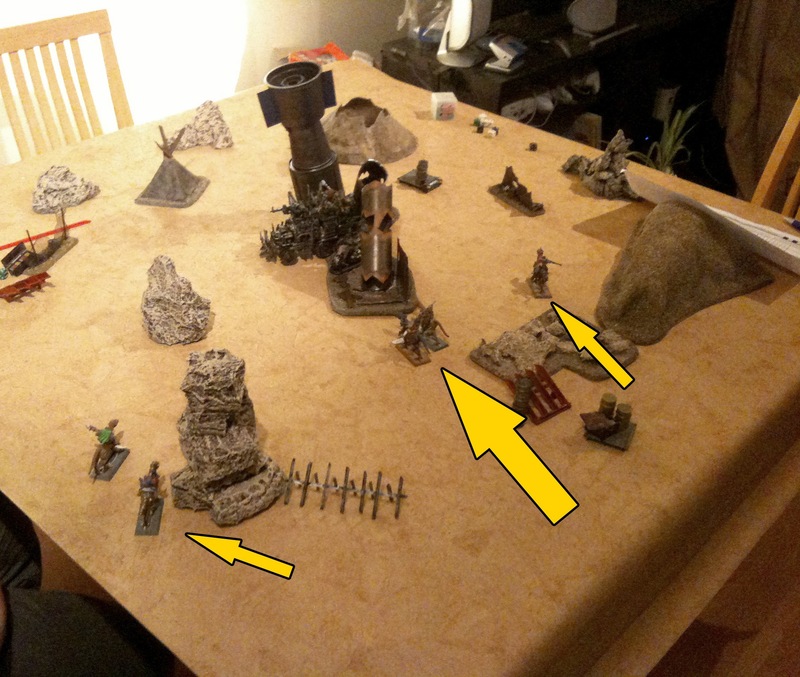 Once that happens the useful aspect there will be that my guys can attempt to board while the weaker members of the mob sidle up, take the scrap, and start to run while the other guys finish combat. The thing with the mutie, he’s going to get a vicious, vicious fight, both my melee combatants, my guys with melee weapons, are brutally powerful now in comparison to most, so that’s going to be fun to do. Otherwise the simple tactic is a very quick shock and awe job. The plan is – we’re going to get really, really drunk and go to the Skid and steal some stuff, some shiny stuff, and then we’re going to make a break for it before the other guys come. Da Not So N00bz are attempting to get to Mektown with their latest scrap haul but the muties have other plans for them, riding in for an ambush. The Gorker mob have four pieces of scrap, three on their trukk, one on their bike. To win the muties have to secure the majority of it, the orks merely have to escape. Due to only having one trukk, the number of orks onboard was increased to make the fight a little more fun, there were also a few other tweaks that may get a mention later. The muties got the first turn, closing in on the Orks and preparing to rain hell on them. Try as they might, they weren’t able to damage the trukk, although they were now in position to take on the trukk when it would inevitably fail its thrust test.. Which it promptly did, stranding the orks in the open. 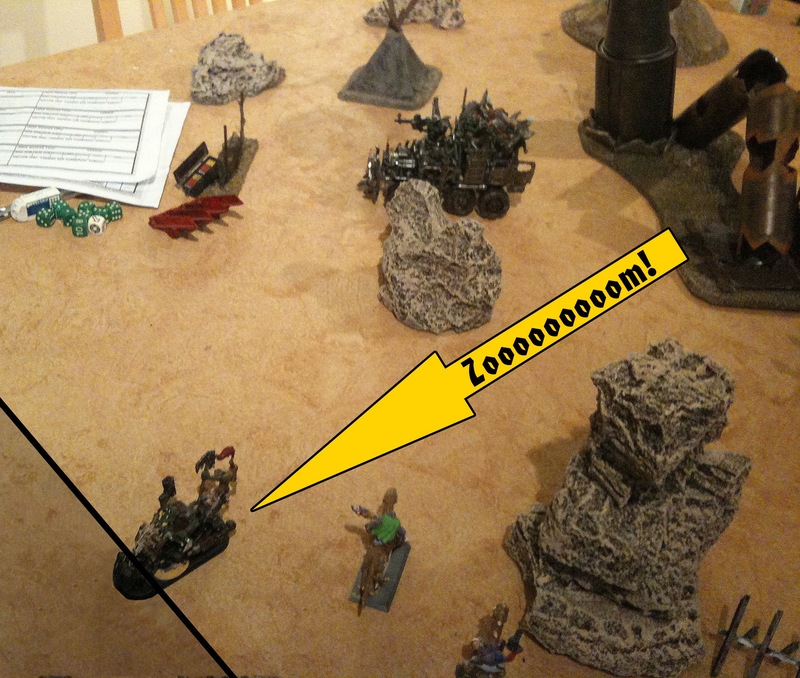 Eugene, the Gorker nob, was not too happy about this and took out his frustrations on Mol, a nearby mutie ‘Unk, putting the warrior down and coaxing a grin from the snarling Ork. Meanwhile, Newton, the biker, and the mob’s grot, Horace (hanging on for dear life), fired up their thrusters and zipped off the nearest board edge carrying a chunk of scrap with them. 1-0 to Da Not So N00bz. 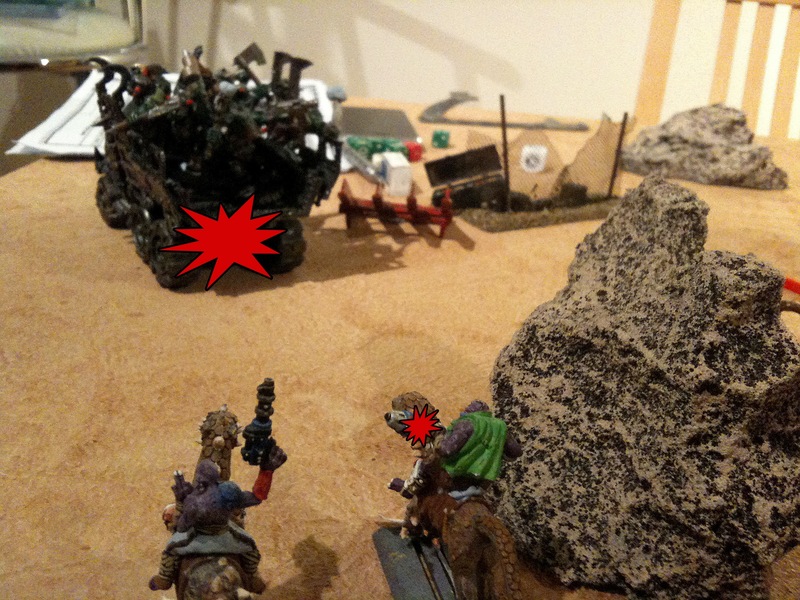 With one scrap counter gone, the muties were not about to hang around, so whilst most of the mob took up positions to take shots at the vehicle, both Mol and Magnus, the mutie seeker, charged towards the stalled trukk and pounced aboard, causing chaos left and right, but ultimately resulting in them both being forcibly ejected by Eugene and Clive. 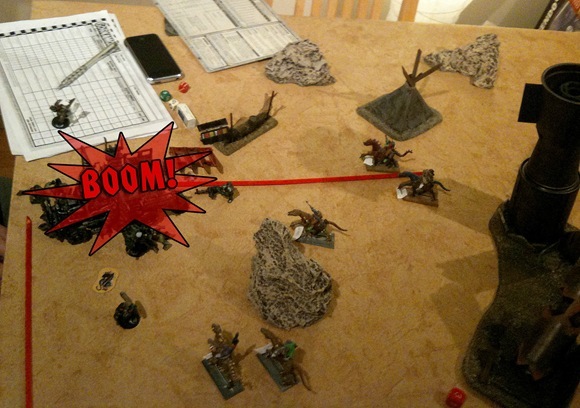 Perhaps leaping into a crowd of angry Orks armed to the teeth wasn’t such a hot idea, but at least the pounce skill was finally put to the test (another first for our campaign). 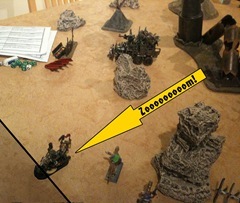 Leonard, the trukk, recovered and was chugging away safely until a turn was required, at which point the driver lost concentration and the whole vehicle slewed out of control wildly, spinning and ending up tantalisingly close to the edge of the board (and safety!). 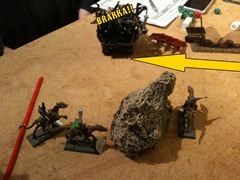 Unable to escape this turn, the crew open fire on the muties, driving them back a little. Hopefully it’ll be enough. 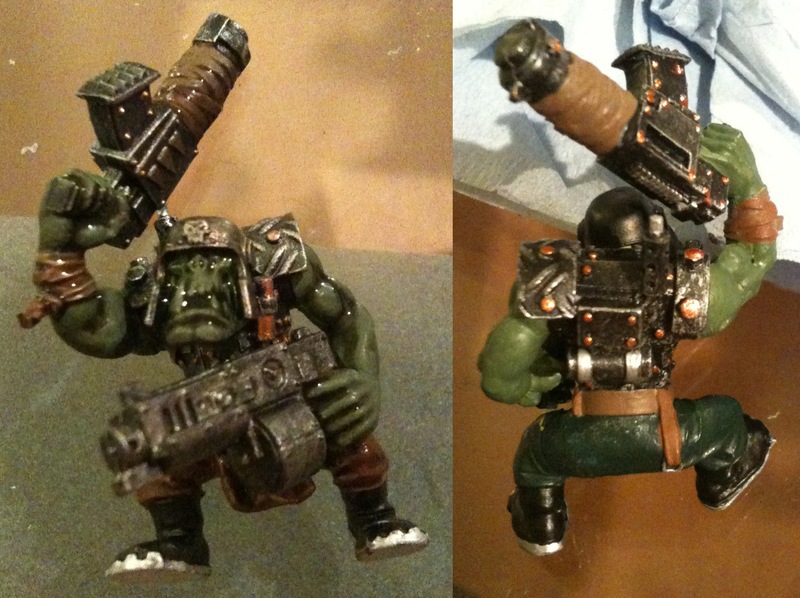 Realising how hard it would be to win in hand to hand with the remaining orks, the muties kept their distance, utilising their fancy ranged weaponry instead. 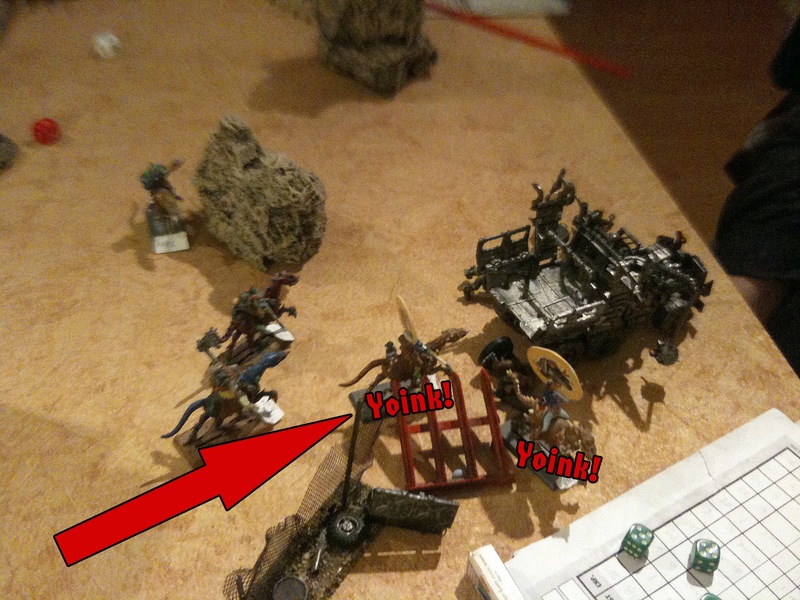 Magnus damaged the wheels, but it was the mutie keeper, Statistix, who really outdid himself, overcharging his weapon (which promptly exploded..) and penetrating the vehicle’s armour, crippling it and immobilising it. 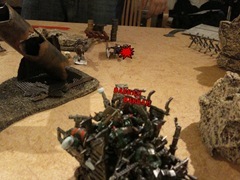 Unfortunately for the Orks, he also hit the fuel lines, leaving the trukk prone to explosion at random. The fuel had a 1/6 chance of exploding at the start of every turn, but it didn’t feel like waiting around – the whole thing went up with a wonderful WHOOMPH! or possibly a BOOM! Who can say? 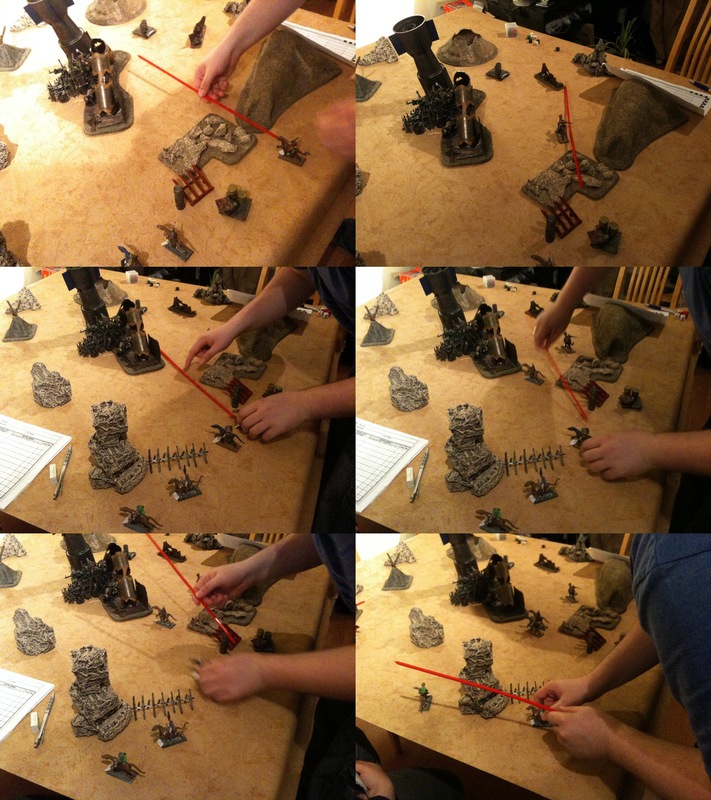 Orks and scrap were hurled in every direction (the rules didn’t stipulate that the scrap should be hurled, but it seemed sensible and entertaining). Each warrior took a S4 hit and many of them went down, although most recovered in the following turn. Those that weren’t down moved to grab some scrap, whilst the others just lay there groaning. 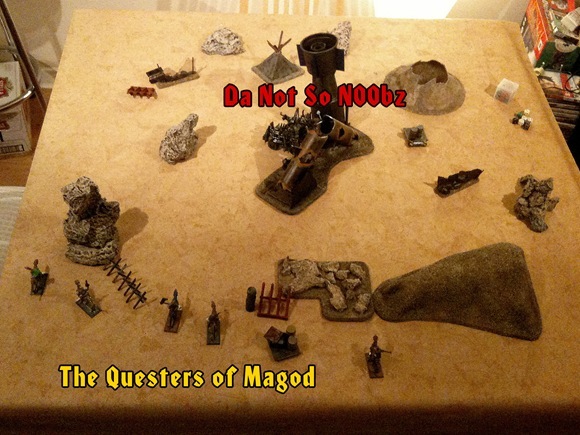 The Questers of Magod saw their chance and ran in to grab the precious scrap that had been thrown from the trukk, ignoring the orks for the time being, although a few took some pot-shots for good measure. 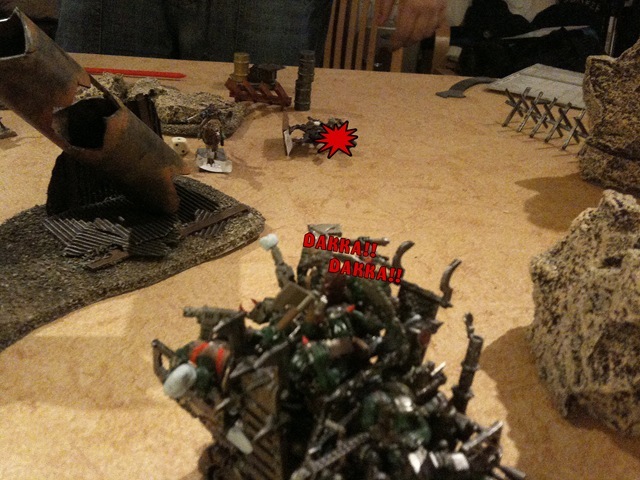 Finally the last of the Orks legged it off the table, one of them carrying a scrap counter, ending the game. Draws do occasionally happen, although they’re quite rare, but these two mobs were relatively evenly matched. That said, had the whole of Da Not So N00bz been present, it’s far less likely that the muties would have done so well. Another factor was the need to escape – these Gorkers are great in a fight, but getting away with loot isn’t really their style. The model isn’t finished, but we wanted to share the in-progress shot of da patient. Comments? 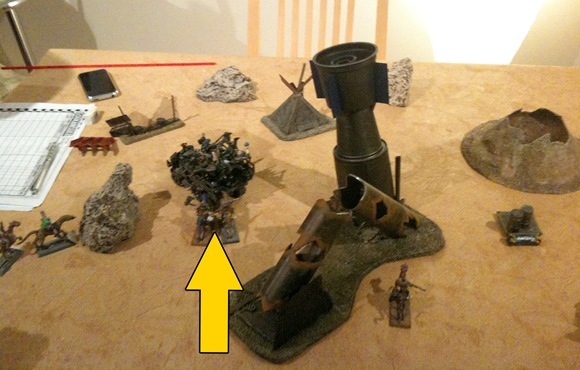 This entry was posted on Tuesday, June 8th, 2010 at 17:31	and is filed under Battle Reports, Modelling. You can follow any responses to this entry through the RSS 2.0 feed. You can leave a response, or trackback from your own site. A bit of a catastrophe for me overall, as I felt I had more than enough power to mow through a group of Boyz and get away nice and quick. Sadly I was wrong. On the other hand, this proves that it’s a viable tactic, I just need less powerful Orks (these are the second toughest in the campaign and possibly moreso as the Gorkers focus on beatdowns) to use it on. A bonus occurred in that the Mutie healing rules that I designed got their first real workout as I sent two of my guys into Da Pitz. Magnus has had his old battle wound fixed, a real priority as if he can’t fight, the mob can’t actually participate in battle, so that’s a plus. I actually rolled a 1 on the table, meaning I had to reroll on the serious injury table but it came up as 100% healthsome, so all was well, all for a single toof. The real interesting point came from Mol who has had a headwound since his second match. It actually made him a crazy melee combatant when he frenzied so I kinda left it on intentionally for a while but it felt like the right time to fix it while I had a decent surplus of teef. The only previous headwound result in a cosmetic Glowing Eyes Mutation so I was hopeful here. As you may or may not know, the new healing rules I wrote incorporate the potential for Fear and Terror. I got lucky and rolled a 6, straight up, giving him “That’s a Mouth! ?”, which means this model now causes fear. Fear was one of those features that was touted in the original books, supposed to appear in Digganob and it never really did. A Mutie with impressive scars does cause fear as well but you’ve got a 1in about 50 chance of it ever coming up. There are better odds of your mutie dying than it occurring. The only other option is the Orky Iron Mask but we’ve yet to see it played. I believe Nazgrab has it (or one of his Boyz) but I can’t be sure. This does mean that technically speaking, if it comes down to a fistfight between the two, it’s them and them alone as other models can’t charge them or enter HtH willingly against them. So all in all, interesting. My boys are patched up, technically running as strong as ever, but my tactics are changing, thanks to the randomness of upgrades to my guys.